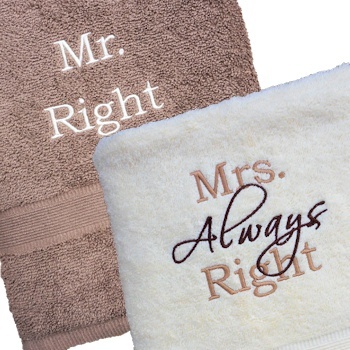 This his and hers bath towel set make a truly special gift. We will embroider and make each of these towels especially to order. We embroider on a pair of cotton bath towels in a colour combination of your choice. Our example is in cream and brown towels, however we have other colour combinations to choose from. The embroidery threads will be made to coordinate the towel colours. 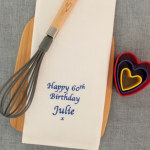 Great gift set for weddings, anniversaries, Valentines Day, Christmas or a housewarming present! Bath towels measure approx 75cm wide x 125cm long.